Associated Press/Manu Brabo. Click on thumbnail to view high-res image. 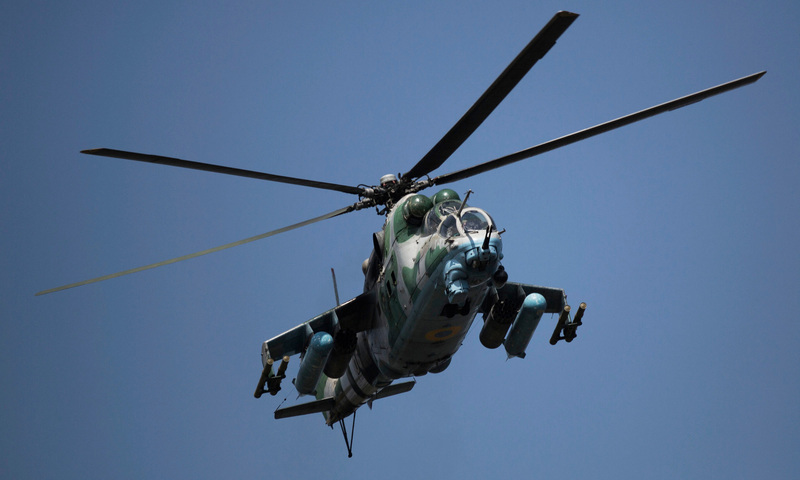 An excellent study of a Ukrainian Army Aviation Mil Mi-24 Hind helicopter gunship as it overflies a Ukrainian army column near the town of Slovyansk, eastern Ukraine, Thursday, April 24, 2014. Interestingly this Hind carries a rarely-seen flexible twin-barrel 23mm cannon in the nose of the Mi-24VP which was built in very small numbers in the late 1980s and the Mi-35M export version, as opposed to the more common four-barrel 12.7mm machine-gun or the fixed twin 30mm cannon on the starboard side of the nose. A pair of B-8 rocket pods carrying 20 S-8 80mm unguided rockets and four tubes of the 9K114 Shturm (AT-6 Spiral) anti-tank missiles complete this helicopter's offensive loadout, while a pair of external fuel tanks are carried to increase endurance. It's not clear if this Hind is an exception, but most of the photos I've seen of Ukrainian Hinds during the current crisis lack the Artem ASO-2V-02 decoy dispensers fitted (although I've seen Ukrainian Mi-8 Hip transport helicopters carry it on their tailboom). Two Ukrainian Hinds were shot down near the town on the morning of Friday, 2nd of May, when the Ukrainian Army attempted to dislodge pro-Russian Ukrainian rebels and Russian agitators from Slovyansk. Two pilots were killed and another captured as a result of the shootdowns, with the fate of the other crew unknown. A Ukrainian Hip helicopter was also damaged by small arms fire in today's clashes. It is not known what weapon(s) were used to down the Hinds, but it is suspected to be shoulder-fired surface-to-air missiles such as the Russian Igla-series MANPADS (Man Portable Air Defence Systems). There have been no previous sightings of MANPADS in eastern Ukraine, but apparently the "concerned citizens" of eastern Ukraine are concerned enough to somehow acquire weapons to down helicopters with such seeming ease.